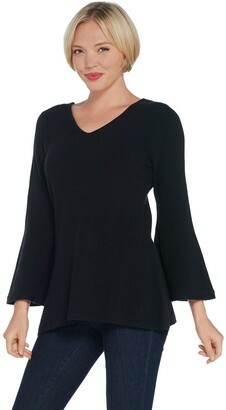 The sleeve of the moment makes an appearance on this V-neck sweater tunic. From H by Halston. Page 1 The sleeve of the moment makes an appearance on this V-neck sweater tunic. From H by Halston. Fabrication: knit Features: V-neckline, ribbed bracelet-length bell sleeves, side slits at hem, tunic length Fit: fitted through the bust and sleeve, cut to follow the lines of the body; flares to an A-line bottom opening Length: missy length 27-1/2" to 29-5/8"; plus length 30" to 31-3/4" Content: 60% cotton/20% nylon/20% rayon Care: machine wash, tumble dry Imported To see the specific garment measurements for this item, click here. 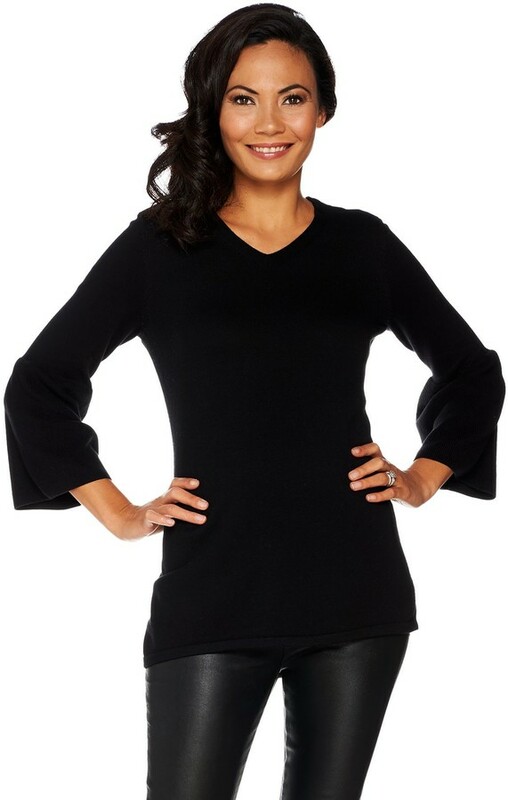 Fabrication: knit Features: V-neckline, ribbed bracelet-length bell sleeves, side slits at hem, tunic length Fit: fitted through the bust and sleeve, cut to follow the lines of the body; flares to an A-line bottom opening Length: missy length 27-1/2" to 29-5/8"; plus length 30" to 31-3/4" Content: 60% cotton/20% nylon/20% rayon Care: machine wash, tumble dry Imported To see the specific garment measurements for this item, click here.